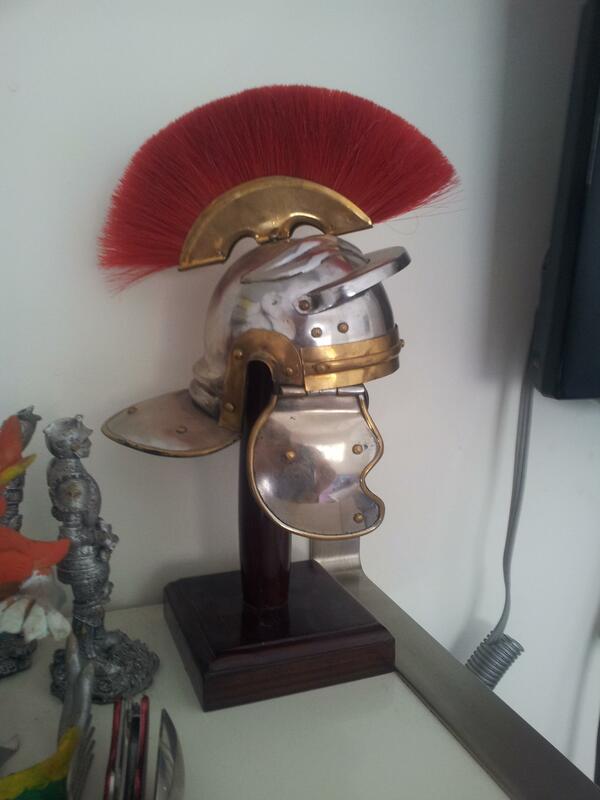 Hmm I tried to draw a roman helmet after a big break from drawing.. I asked a friend of mine and she said that the shading should be more clean because it's metallic so I tried to clean it a bit. But the cheek shield bothered me so I tried to reshade it but now it's not so reaistic.. And I don't know how to fix it.. I'm pretty much new to pixel arting... Just so you know..
Maybe you should practice on simpler stuff first so you can get a good grasp of shading basics? Anyway we'd need to see the reference for this helmet. So far, volumes are hard to tell. Haha yes, I know it's a difficult task.. I'm not a real beginner but I also don't have a lot of experience. So I just started to draw it.. And it's a good practice in general don't you agree? Is this something you own? If so, choose a better viewing angle! Maybe practice sketching it (on paper) from a number of angles, till you find the best possible angle for volume readability. In your version, front and back are not obvious to unfamiliar viewers. Also the crest is slanted towards the back and not level as in yours, this is an important front/back clue. As for shading, the problem with bright metal is everything you see is a reflection of the surroundings, and not much more. A very soft light will make everything even, maybe to the point of looking dull. Bright lights will create a lot of speculars, to the point of confusion. The advantage of drawing over photography is you don't need to be consistent in these reflections, but you need to look hard at it in various light settings. Taking pictures helps, too. It's really helpful, Thanks a lot! I see what you mean, i'll try to draw some sketches from different angles as you said as well as different light source directions. And then I'll try to redraw it and upload it again. Ok, I actually did a few sketches of the helmet from different perspectives. What do you think? Is it better(perspective\readability wise)? good, now use broad blocks of color to divide each part of metal into shadow/mid/highlight. try to study the way a single strong light source plays on metal. Hmm I didn't have much time because of tests and work.. I'll try to do some research on metal shading when I'll have some free time. Try using three colors for each kind of material, that would probably help you eliminate the pillow shading around the center. Also shoot for consistency, it looks like your light source is a little confused. I'll shoot you an edit when I get home. No, I mean reduce the colors. To easily manipulate the light on an object it is essential you begin simply. Try using only three colors for each material.